There are a lot of baby sleep training methods out there. This post outlines six rules to follow for using cry it out as your sleep training method. Sleep training and potty training are my two most dreaded milestones with each child. There are a lot of baby sleep training methods out there. You can go for extinction sleep training for something fast and effective, or you can go for some no tears sleep training. 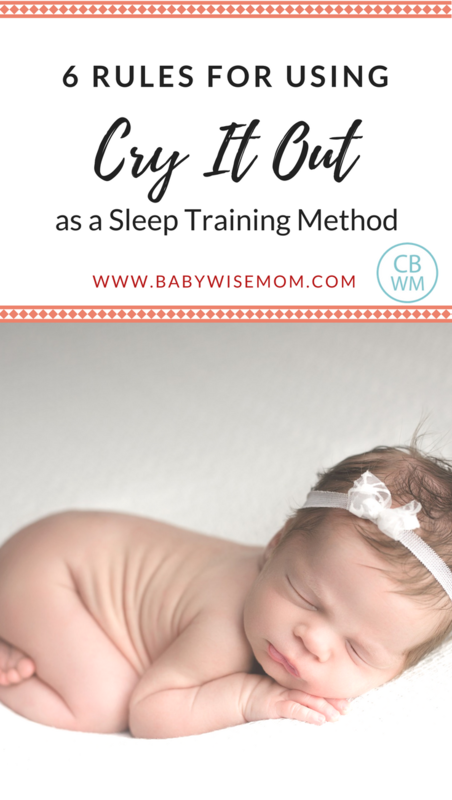 I personally have done sleep training in multiple ways with my multiple babies. No matter your sleep training method, there are rules that can help you. Before my third child was born, I read up on Sleep Training: The Four S’s and really liked the idea of that. It is a gentle, no tears sleep training method and was very simple to follow. It also helped me get optimal waketime down perfectly. I did that with my third and fourth babies and we got to skip the cry it out part of sleep training for the most part (one had a couple of cry it out sessions around 3 months) and both slept on their own from birth. So I love that. If you have a newborn, I highly suggest checking out my post on that. Today I am talking rules to follow when using cry it out as your method for sleep training. I have done many methods and they all work and have their own merits and drawbacks. Cry it out is fast and effective. There is also evidence that doing cry it initially means that after a disruption later in life (travel or sickness, for example), the baby will go back to sleeping well much faster than if you use another method of sleep training. So while there is some crying, it can be less crying overall when you look at the big picture. If you don’t like crying, however, that is fine! There are other options for reaching your sleep training goal. If you are following Babywise, know that there isn’t one Babywise method for sleep training. One of my favorites in the context of this post is Study: Letting baby ‘cry it out’ won’t cause damage. You can read my post on Sleep Training According to Babywise for more. Look into the different ways to sleep train before settling. If you do settle on cry it out, here are six rules to follow. Before you get started doing cry it out for your sleep training method, you need to define what it means to you to do cry it out. There are many sleep training methods labeled “cry it out” that actually vary quite a bit. One extreme is call extinction. This method is when you put baby down for a nap or night and you do not go in again until the baby has slept. This is the hardest for parents to face, but statistically speaking, it gets the fastest results and baby is typically done with cry it out this way much faster this way. I am not one who is comfortable with words like “never” or “always,” so the extinction method as a hard and fast rule leaves me a little uncomfortable. I think all people are individuals, including babies. What works for one will not work for another–that is what makes them challenging and what makes me dislike sleep training and potty training so much. I feel like in many ways I am reinventing the wheel with each child. Each child needs their own wheel. Some people like to do a sleep training method where they go in after five minutes, then after ten, then after fifteen, etc. I don’t really love this method, either. I think it is a method aimed at making parents feel better about themselves but not at helping baby have the most success to be perfectly frank. Sleep training isn’t about you; it is about the baby. With that said, I am also sure there are babies for whom this is the very best method. So if you feel it is right for your baby, do it! For me, cry it out sleep training is defined by the baby. I had one child who just did very poorly if I ever went in after I left him for his nap. He cried less if I went with the extinction idea. My second came along and she did better with a visit from me, but only at the right moment. Too soon and the nap was shot. Too late and the nap was shot. Like I said, new wheel for each child. So decide what cry it out is to you and be flexible to change it up depending on what ends up being best for your individual baby. I can promise you one thing. If you start cry it out sleep training during a sickness, teething, growth spurt, move, etc., you will most likely fail. Baby won’t respond well and you will not keep your wits about you. When baby cries, you are going to think, “Is she crying because it is normal for cry it out, or is she crying because she has that cold and can’t breath? Should I go get her? I think I should get her.” There will not be success because there will be no learning. It is hard for a baby who is already trained and sleeps well to sleep well when fully congested or when in the middle of a move, so it isn’t fair to your baby to expect her to develop new skills when she is uncomfortable or life is in upheaval. Wait until you feel you and baby are in a place that you can both handle the process well. I can promise you something else. Cry it out is hard. No one likes to listen to their baby cry! No one likes it. Do not start it if you won’t finish it. I must caveat here. You might think you can handle it, start and decide “Nope! Not happening.” If that is the case, go ahead and stop. If you start and discover baby has a cold, go ahead and take a break if you feel that is best. If baby is having a rough time one nap and you really feel like it is best to intervene, trust yourself and do it. But do not start, get baby after ten minutes, then next nap start, get baby after ten minutes, etc. All you are doing in this case is letting baby cry for no reason. You want baby to learn to fall to sleep, not cry. If you don’t see the sleep training through, learning will not take place and you have let your baby cry without any purpose. Once you start, let there be extreme consistency for your baby. Figure out what works for your baby and stick to it. Do your best to be home as much as possible during the process. When our oldest was a baby, we had a lot of pressure from some family members to visit ALL the time. He did not have consistent times at home to learn to sleep. I finally realized that it was a problem, put my foot down, and limited how often we would be leaving home until he had it down. Once I did that, he made really fast progress in his sleep training. The biggest key to success for cry it out as a sleep training method is identifying your child’s optimal waketime length. This is the KEY. Figure this out. Knowing nap cues can be helpful, though not all babies offer those up. Part of knowing optimal waketime is identifying what point is the point of no return. Sometimes you will have disruptions that keep your baby up too long. With my second child, she would not sleep at church. No way. I knew if I went home from church and put her in her bed, she would scream. I didn’t feel that was fair to her. After that disruption each week, I went home and put her in her swing instead. She is not now nor was the worse off for it. This book talks in detail different ways to do cry it out for sleep training. It also talks in greater detail the importance of sleep. This is why we sleep train our children. Sleep is important. It is vital. Sleep is underrated and undervalued in much of our modern world, but it is vital to brain development. This book will give you the courage to do sleep training. (And I don’t want to stress out anyone with a short napper; my oldest took short naps until 6.5 months old and didn’t sleep through the night until 6 months old, so don’t think if you have a short napper your child is ruined for life). Remember, your goal here is to get your baby falling asleep independently. That is why people do cry it out or any of the sleep training methods. Cry it out is one way to get to the goal of sleeping independently. If you don’t feel comfortable with cry it out, you don’t have to do it to get to sleeping independently. Look into other methods. If you do choose cry it out, have heart! It will get better. It is not fun, but the results are worth it. Find someone to support you, have a plan, and move forward. PS–if you need support, the Chronicles of a Babywise Mom Facebook Group is a great place.